Last year, we spent way too much on groceries. We eat an exclusively grass fed meat and organic produce diet. Because we put a high priority on quality food to heal our leaky guts, we skimp on other areas so we have more money for groceries. (Our car is nine years old, for instance, and besides lap tops and Trac Fone cell phones and a Nook, we don’t have any tech gadgets). 1. Look at alternative produce sources. I spend a small portion of my grocery money at Whole Foods and a larger portion at Trader Joe’s. I’ve also used CSAs. This year, I’ll still do that, but I’ve heard that Aldi has an organics line, so I plan to check that out. I also plan to take advantage of the uber cheap frozen organic veggie staples like peas, beans, and corn at Costco. 2. Begin freezer cooking again. A few years ago, I used to have a freezer cooking session every month. I slowly dropped that habit, but I plan to start again this year. (I already had my first session on New Year’s Day!) This should save on groceries because I’ll buy all my ingredients for dinners in one shot at the beginning of the month. 3. Shop every other week. Shopping is getting to be a drag. I think I’ll save money and time if I only shop every other week. My only concern with this is that we eat A LOT of fresh fruit. Those of you who already do this, how do you handle fruit and veggies? What do you do for the second week? 4. Buy produce in season in bulk and can or freeze for the rest of the year. We did this last year with grapes, plums, apples, strawberries and blueberries. I’d like to find a way to expand this and process even more fruits and veggies. My challenge is finding reasonable sources for organic produce near us that I can buy in bulk. I’m also not the world’s best canner, so that’s another skill I have to work on. 5. Serve filler items with the rest of meals. My husband is Japanese, so his go-to filler is rice. I’ve also learned how to make Gluten Free Banana Bread, which isn’t that expensive. Still, I need to find more fillers that are allergy friendly. 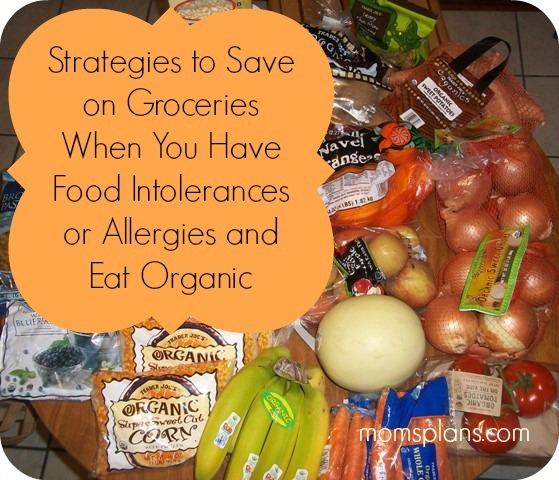 By using these strategies, I hope to keep my grocery bill for our family of 5 between $700 to $800 a month, instead of the $800 to $1000 a month we paid in 2013. What are your favorite grocery savings tips? Last year we bought 50 pounds of blueberries; we froze 30 pounds and we used 20 pounds to make jam. We ran out of blueberries in January. This year, we decided to buy more. We headed out on a warm, humid Saturday with the goal of picking at least 30 pounds by ourselves. Bookworm is a big helper, and Peanut Butter and Jelly Girl is becoming quite the helper, too. Both picked diligently. Cuddle Bug? Not so much. She picked about 5 and then decided she was hot. She was thirsty. She sat in the shade, and soon she was drenched in sweat. We picked for about 40 minutes and got 10 pounds. The rest we had to buy already picked. We spend $182, and we got 70 pounds of organic, local blueberries. We averaged $2.60 a pound on those. So far, they’ve all been going in the freezer. If I have time in the next day or two I’ll make some jam. Otherwise, they’re all going in the freezer so they can last us until next July. That gives us 6 pounds of blueberries a month, right? Hopefully that will last a year. Have you been picking any fruit lately? Are you stocking up for winter? We’re Renting an Organic Apple Tree! In an effort to curb our grocery bill, we’re trying to stock up on organic produce when it’s in season and at its lowest price. So far we’ve filled the freezer with plums, grapes, and strawberries. 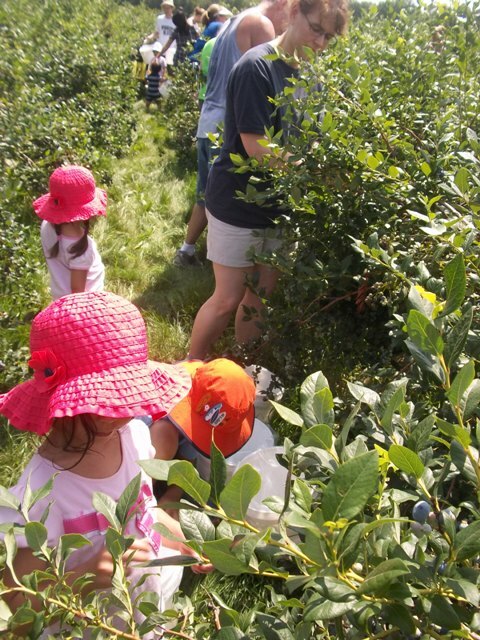 Before the end of July, we’ll go pick blueberries and put those in the freezer, too. Late last month, my husband and I decided to sign up for a program that let’s you “rent” an apple tree from the farmer. We’re renting ours from Earth First Farms. We rented both a Paula Red and a Rome tree. The Paula Reds will be ready in mid-August and the Romes will be ready in mid-October. I’m planning on turning most of the Paula Reds into applesauce. We’ll also turn some of the Romes into applesauce, but we’ll try to store some to last us through the fall and into the winter. Renting one apple tree costs $55, and depending on the harvest, we could walk away with anywhere from 80 to 120 pounds of apples. That works out to 68 cents to 45 cents per pound for organic apples! We’ll go to the farm and pick the apples ourselves. Can’t wait to try this! 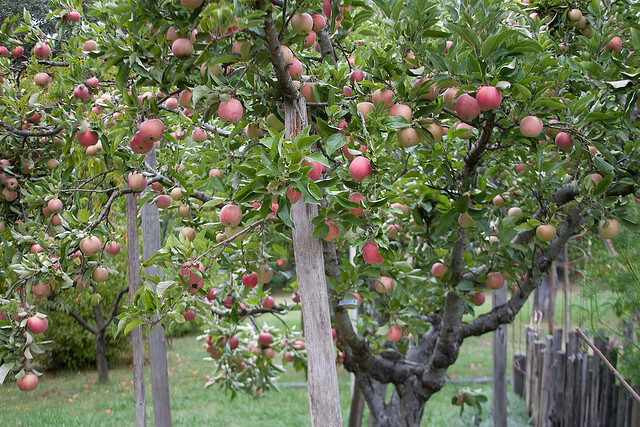 Have you every heard of renting apple trees before? You’ll remember that the purpose of my pantry challenge this month is not to save money, but instead to funnel money to stock up on seasonal fruits so we can save money in the winter. As of my first report last week, I spent $282 and had $468 left in the budget. In total (not including the veggies in the middle from the CSA that we paid for in May), we spent $144.29. Higher than I would like, but I guarantee we’ll eat almost all this food this week. Total now, I’ve spent $426.29, and I have $323.71 left in the budget. I need to be careful because we plan to buy organic blueberries sometime this month. Last year we bought 50 pounds, which seems like a lot, but they were all gone by February. This year we’re going to buy 80 pounds, and depending how much we pick ourselves, they’ll cost somewhere between $160 and $240. Besides that big expense, I’m getting low on the meat that I can eat (lamb, pork, chicken and turkey), so I’ll need to buy some of that soon. That doesn’t leave much for the last 10 days of the month. Still, I think keeping the budget tight and stocking up while the CSA is flowing is the best way to try to keep the budget in check. Are you stocking up on any seasonal produce? If so, which ones? Last July, I set the goal of spending less than $200 per week on our organic produce and grass-fed meat. I thought that we’d be able to do this easily by freezing some items from our CSA and eating a lot of beans. The plan went well for the first two months until I discovered I was intolerant to many vegetables, grains, gluten and beans. I went on a Paleo auto-immune diet and watched our grocery bill soar. However, I hadn’t given up yet. When I gave up was when my son’s intolerance test came back and he had almost all the same intolerances as me, including vegetables, grains, gluten, fruits and beans. Our Grocery Bill Will Always Be High, Won’t It? I’ll be honest, I had a month of feeling a bit sorry for myself and feeling like there was no way to save on groceries and that I just had to get used to outrageous grocery bills until we healed and could eat more foods. But then I read the Prudent Homemaker’s posts on how to save on groceries. Sure, a lot of strategies don’t apply to us right now, but one thing I gleaned was buying in bulk. Even if we are on a special diet, we can still buy in bulk. Then, I read that Jessica at Good Cheap Eats is having a pantry challenge. I never understood the point of a pantry challenge in July when so much seasonal produce is so cheap. 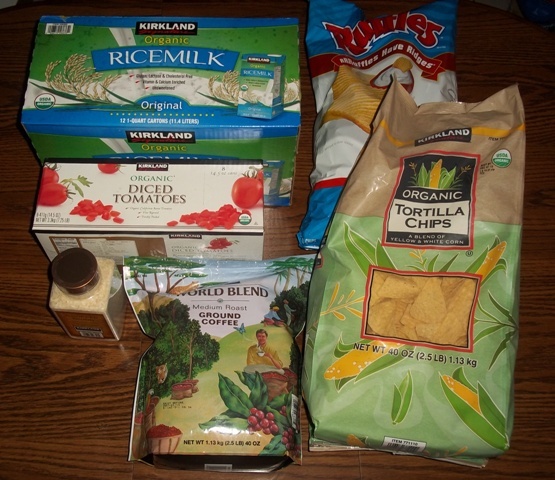 But, her pantry challenge and the idea of buying in bulk go together, in a way. For the month of July, I’m going to spend much less on our weekly groceries and simply eat from the freezer and the CSA box. That will free up a few hundred dollars to stock up on seasonal produce to preserve for the winter. The challenge this month is not so much to spend less money as to use the money I have to stock up on low priced produce for the winter months. I’m hoping this pantry challenge will help me get a bit ahead and lower the grocery bill throughout the year. The grocery budget for July is $750. I’d like to use at least $500 of that to stock up and fill the freezer and pantry. The other $250 will be used for basics that we need like rice and soy milk, fruits, and oils. 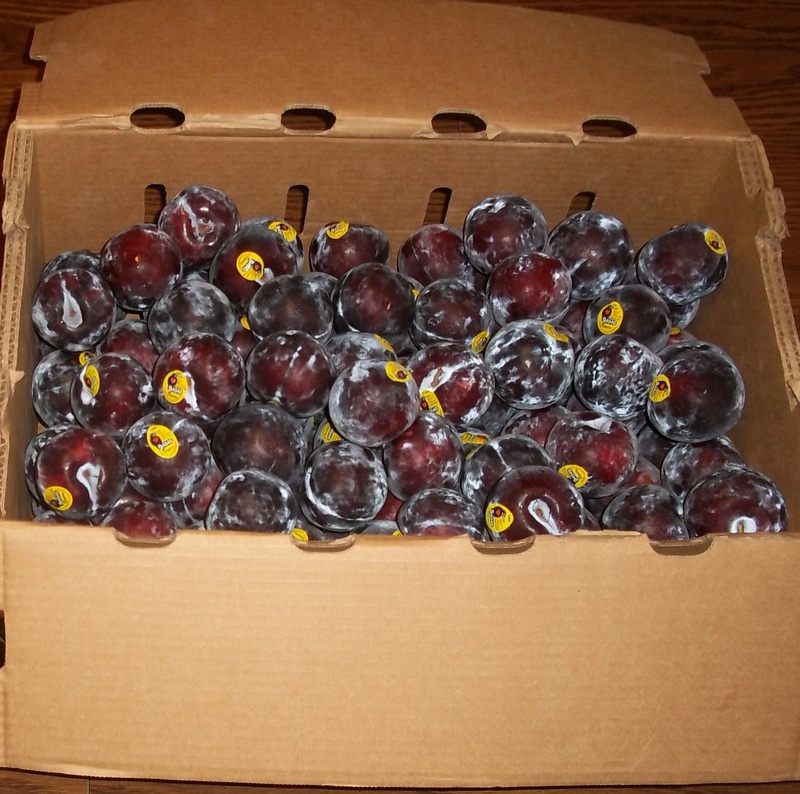 I started the challenge on July 1st, and Whole Foods put organic plums on sale for $1.99 a pound. I’m sure I could get non-organic at a better price, but we feel it’s important to eat organic, especially as our bodies heal. I bought 40 pounds to preserve and about 4 pounds for us to eat fresh. I simply peeled the plums, diced them, added some Fruit Fresh to prevent browning, and put them in a quart size freezer bag. (It took about 8 to 10 plums to fill the freezer bag.) Then I added 1 cup of organic apple juice to the bag and sealed. We ended up with 21 quart bags of plums. That’s not enough to last us through the winter, but the purchase was within our budget and will give us a nice treat every two weeks or so when we get bored of winter fruits. I also stocked up on gluten free flours on Amazon and bought a 5 lb. 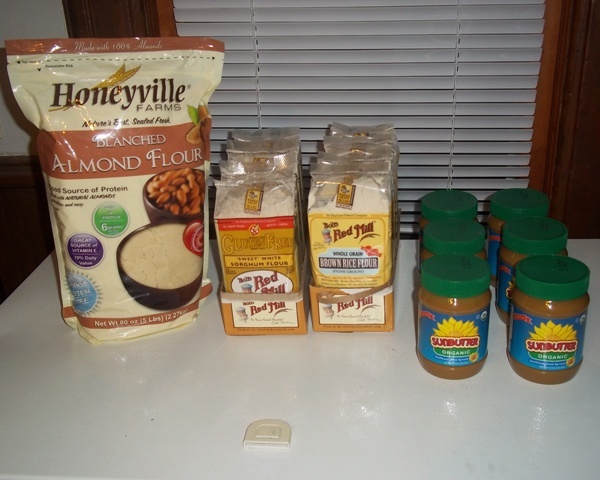 bag of almond flour, 4 small bags of brown rice flour, and 4 small bags of sorghum flour. The gluten free flours on Amazon are as cheap as I can find them, but if you know of another good source for gluten free flours, please let me know. My son and I are both off nuts for now because of intolerances, but we can have sunbutter. I love it for an afternoon snack with apple slices. However, a jar of organic sunbutter is $9.99 at our local store! Instead, I purchased 6 jars on Amazon for $6.63 per jar. Still expensive, but much better. All told this week, I spend $282 on groceries. That will be enough to see us through our regular groceries until the 13th. On regular groceries for two weeks, I spent $83.45, and on bulk plums, organic apple juice and my Amazon purchase, I spent $198.55. I have $468 left for the month, and we are planning to buy organic blueberries at a u-pick farm in the next week or two when they become ready. Can’t wait!